Bondi Beach Cottage Inc. is a not for profit community organisation based in the heart of Bondi since 1984. We provide a range of family services to support our community. We are a registered charitable organisation, so any donations gratefully received are fully tax deductable. 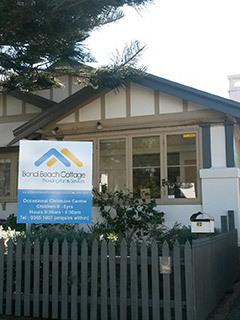 Bondi Beach Cottage Occasional Child Care Centre provides care for up to 20 children per day. We maintain low ratios (1 educator to 4 children) giving highly individualised care and attention to each child. We cater for children aged 0 – 5years. Our small centre has a family day care feel with the security of centre based care. We offer both casual and permanent care, with both half days ($50) or full days ($88) available to work around your schedule. All our staff are trained educators with a minimum certificate 3 qualification. Bondi Beach Cottage Occasional Childcare Centre caters for up to 20 children per day. We have low ratios (1 educator to 4 children) with all our children playing together in one big indoor /outdoor space, we do not separate them into rooms. We provide a rich and diverse educational experience for children, reflective of the child’s development and interest. We offer permanent day care and occasional casual day care sessions, with both full days and half day places available for children between the ages of 0 – 5 years. Once you child is registered, occasional places can be booked 2 weeks ahead. There is often a waiting list for permanent places depending on your child’s age and the day you may require, however this does not mean you cannot utilise the casual booking system until a spot becomes available. We operate between 8.30am to 4.30pm Monday to Friday for 50 weeks of the year. The service is open all school holidays except for 2 weeks over the Christmas and New Year holidays when we are closed, usually the last week of December and the 1st week of January. Concession rates are available if you are a Centrelink Healthcard holder. Please note: You must provide a copy of the birth certificate and a copy of the immunisation record. The enrolment form allows you to take a photo with your smart phone and attach these and any other relevant documents. If you hold a Centrelink Health card concession rates are available. Click here to download a PDF copy of the Handbook which you can download and print. Please feel free come down and say hello and take a look at our centre!